The seventh edition of the FCBEscola International Tournament was presented midday today in the Ciutat Esportiva Joan Gamper. The competition is going on from March 26 to 29 on the club grounds and features more than 1,900 boys and girls aged 6 to 14 years in 172 different teams representing 45 FCBEscolas and FCBCamps from 22 countries. The main change this year is that the opening ceremony is being held in the Camp Nou. 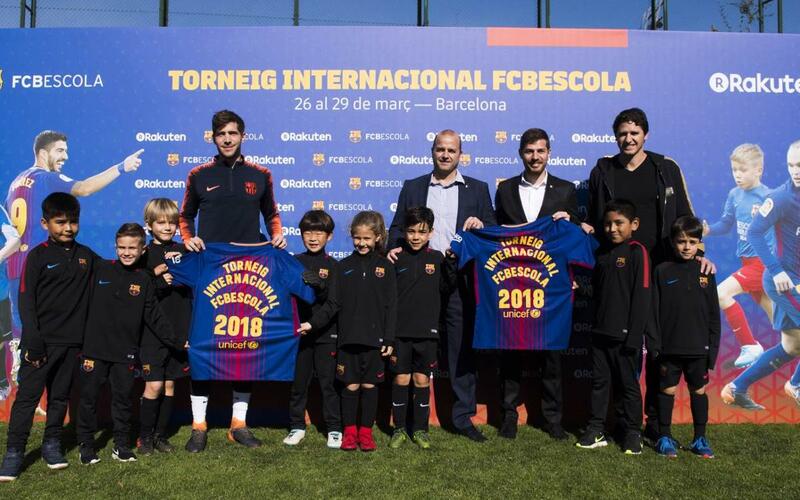 The patron of the 2018 edition is first team star Sergi Roberto, who met some of the players from FCBEscola Barcelona and wished them well for the tournament. For the first time ever, players from all five continents will be taking part in a competition that is growing year after year in terms of the number of FCBEscolas and FCBCamps attending. The number of teams has grown from 33 to 45 in just one year, and from 1,499 players in 2017 there are more than 1,900 this time round. This also means more games, a rise from 457 last year to 592 in 2018. The opening ceremony is on Monday 26 March at 10.30 am in the Camp Nou, and the finals in the four categories of the tournament will be played on Thursday 29 from 11.30 am in the Miniestadi. “The FCBEscola project is very important for us. Barça is now open 24 hours a day with its different FCBEscolas around the world. The growth in the number of schools is happening sustainably, for we go for quality rather than quantity. The transmission of the Barça style of play is channelled through our local project directors, who are trained at the club. This year, for example, a hundred coaches were trained on our premises at the FCB Coaches Academy, where they learn about our DNA”. “The truth is that coming to Barcelona and feeling the experience of being so close to your heroes is something that really excites the children. Although they all come different countries and cultures, football unites them. It is very important that players like Sergi Roberto are getting involved in this project, for the children as examples of footballers and people. The most important thing is the idea of how we play, the methodology and the teachers”. “The FCBEscola children from all around the world are getting ready to come here and enjoy what will be a real fiesta for them. At the tournament they’ll be able to enjoy feeling much closer to FC Barcelona and interacting with the Barça world, visiting the facilities, going on the Camp Nou Experience...”.